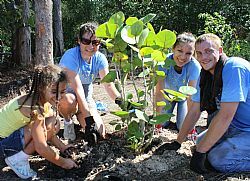 SARASOTA – A group of 55 SBEP Bay Guardian volunteers planted 500 native plants and removed small exotic Australian pines at North Lido Beach Park on Saturday. The group included 20 middle school students from the Duke University Talent Identification Program, a marine biology summer camp focused on estuaries and marshes. Bay Guardian volunteers planted more than 2,000 plants last year at the same site. The plants going into the ground Saturday were donated by the American Littoral Society and Sarasota County. The project at North Lido Beach Park was the fourth volunteer outing for the SBEP Bay Guardians. Prior outings this year took place at Emerson Point Preserve in Manatee County, North Water Tower Park in Sarasota County and Quick Point Preserve on Longboat Key. The tidal tributary project at North Lido Beach Park was completed in March 2011. The restoration effort improved 30 acres on the 70 acre site. It included the removal of non-native vegetation, excavation of the tidal wetland, contouring the upland area, creating dunes, and planting thousands of native plants. The tidal wetland was created to provide essential habitat for estuarine dependent fish species. Florida Native Nursery planted more than 8,000 at the site last spring. Major funding for the restoration project comes from Southwest Florida Water Management District and the U.S. Fish and Wildlife Service. Individuals and organizations supporting the project include the Lido Shores Property Owners Association, Lido Key Residents Association, Sarasota Audubon Society, and Captain Jeffrey Karr with the Sarasota Police Department. The Sarasota Bay Guardians is a family-friendly program that SBEP manages in partnership with Around the Bend Nature Tours. New volunteers receive a blue t-shirt featuring the Bay Guardians logo. Each outing features environmental education and a picnic lunch. Join the Bay Guardians for a single project or as an ongoing commitment. Local school, scout and church groups interested in volunteering can contact Sara Kane.